So many intriguing recipes, so little time! Since we're roasting ducks today for our Christmas dinner, we'll be rendering duck fat. (And later I'll take all the duck livers and make paté.) But that meant it was time to get rid of all the duck fat I've saved up from last year. There were 6 or 7 pints of it and I've used it throughout the year to make confit, in baking, and as a topping on vegetables instead of butter. While it could probably last longer I felt that turnover was a good thing and found a recipe for which I could use up a bunch. Not just ordinary donuts! Duck fat donuts. 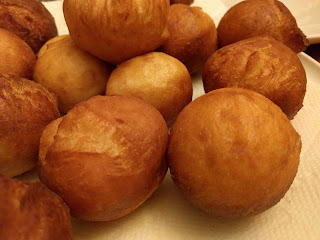 Actually the recipe calls for duck confit to be stuffed inside the donuts but I didn't have any confit nor the will to take two days to make some, so I just made the dough and deep fried them as a side for dinner last night. It turns out the initial step is to make a sort of poolish from yeast, milk and flour and waiting an hour. If I do these again, I might try using a cup of Legion for this step. It'll save time and might add something interesting to the flavor. Anyway, once the donuts are rolled into little balls, they are deep fried in duck fat. They came out perfectly! Light and fluffy and ever so slightly gamey. And really not that hard. Dinner last night consisted of maple-bourbon steak tips, fresh fruit, these donuts, and chicken milk. Which is what we call eggnog ever since the elderchild took French and learned that the French word for eggnog is lait de poule. Chicken milk.